[It] Permette di creare scorciatoie da tastiera da associare al lancio di programmi o pagine web. Permette anche di associare i tasti alla scrittura automatica di testi. 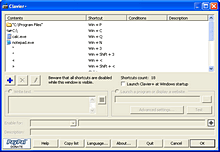 [En] Clavier allows to create keyboard shortcuts using almost any keys, including the Windows key (around the Space key). [It] Decomprimere l'archivio.zip ed avviare l'applicazione eseguendo Clavier.exe. [En] Extract the ZIP package to any folder of your choice, launch the program by double-clicking Clavier.exe. Lingua/Language: French, English, German, Brazilian Portuguese.